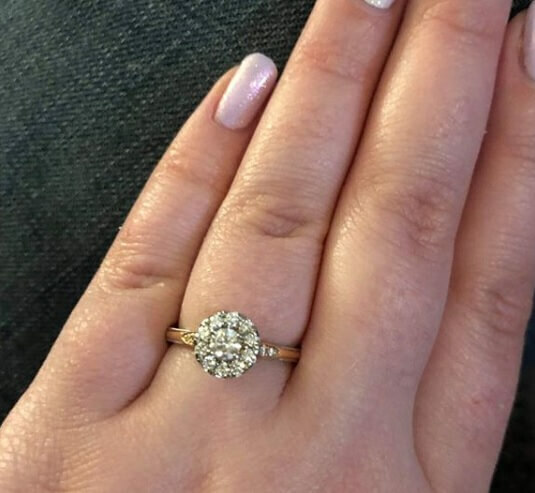 Our dear friend Ryan gave me the huge honour of designing and making Caity’s engagement ring. She had shared images of engagement rings she liked with him in the hope he’d get the hint. These were very useful as a starting point for Ryan and I to work on a unique design made especially for her. 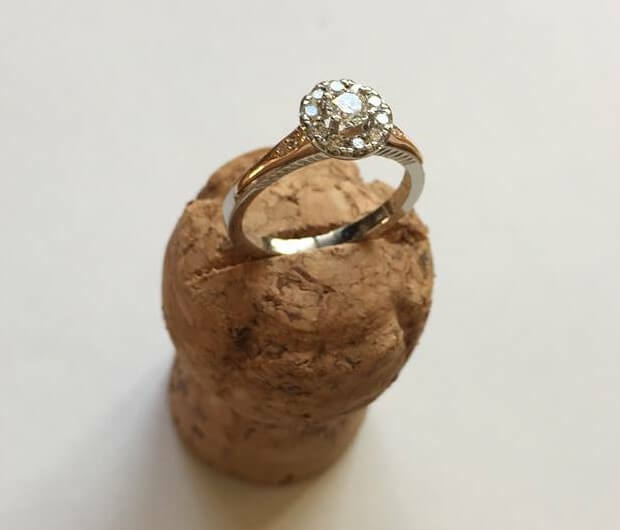 It was clear from the selection she had pinned that she liked the halo setting style, mixed metals (particularly the pretty combination of rose gold with platinum) and nods to vintage style. Ryan lives in Canada and I am based in the UK but this was not a problem at all – we spoke over Skype and messaged images and sketches back and forth until we had the perfect design sorted. 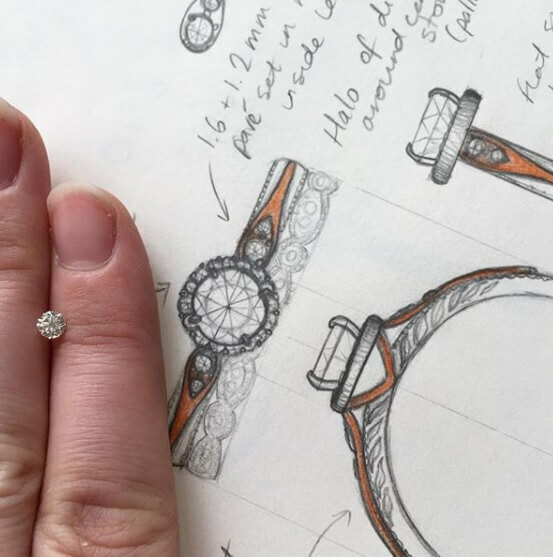 I then went on a search for the sparkliest diamonds I could lay my hands on and had 3D renders drawn up of the design. These CAD images were then 3D printed and cast into their metal components, which we then joined, set and finished by hand. 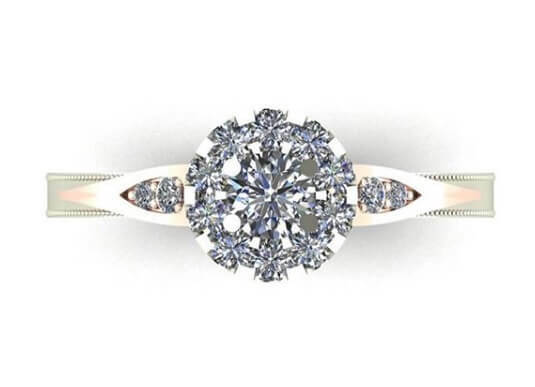 The central halo setting is set high to allow lots of light to flood these gorgeous stones – photos just don’t do it justice. 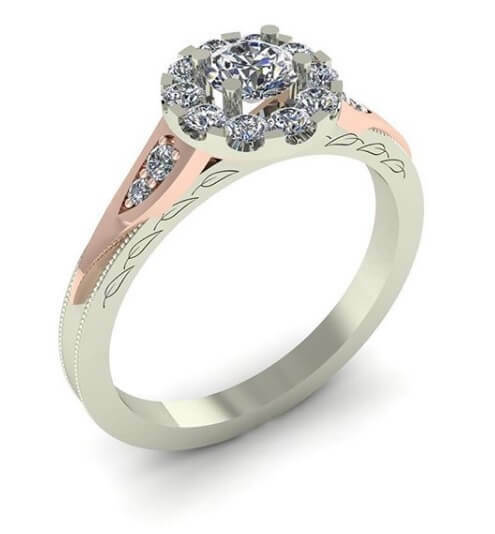 The open tip design of the setting is stunning from the side view, with the rose gold framing the shape of the diamond. On the shoulders, the rose gold overlays have pave set diamonds to add further sparkle. The ring is finished off with millgrained edges to the platinum band, and engraved leaf shapes on the side for added texture. We’re now in talks about their wedding rings which we will be able to hand deliver for their wedding in Canada – I cannot wait!